This 30-minute meal packs in lean protein from the turkey, lots of vegetables, and healthy carbs from the sweet potatoes. Sweet potatoes are packed with vitamin A and have a lower glycemic index compared to white potatoes. While potatoes are cooking, spray a large sauté pan with cooking spray. Add onions and sauté over medium-high heat for 3 minutes or until onions look clear. Add garlic and sauté for 30 seconds. Remove from pan and set aside. Add turkey and cook until brown, about 6-7 minutes. Add onions back to pan and stir to mix. Add diced tomatoes, mixed vegetables, yellow mustard, Worcestershire, and black pepper. Bring to a simmer. In a small bowl, mix together corn starch and water. Add to turkey mixture and stir. Let simmer for 5 more minutes. Preheat broiler. 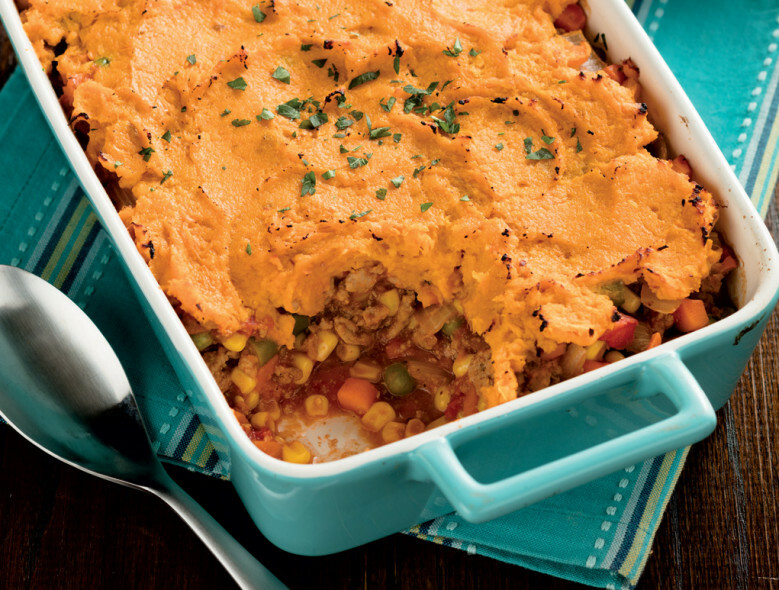 Pour cooked turkey mixture evenly into an 11x14 inch pan or medium casserole dish. Spread sweet potatoes evenly on top of turkey mixture.